To celebrate its 10th year, Mattiazzi is launching seating by Jasper Morrison, Konstantin Grcic, Foster + Partners and Industrial Facility, who guest art-directed the collections. For 2019, the Italian furniture brand has worked with Sam Hecht and Kim Colin of London studio Industrial Facility to assemble four separate collections by four esteemed designers and studios. The collections include chairs and stools and will launch at Milan design week. Hecht and Colin have contributed a chair and low stool made from pine wood and steel called Fronda. Inspired by contemporary, nomadic culture and the need for a place to store personal items in public places, the sculpted steel seats house storage in their bases in the form of a single wood shelf. The seat with integrated storage is a new typology for Mattiazzi and also the first Mattiazzi chair to use wood for the structure and metal for its seat. When placed side by side, the ash base creates a natural spacer that allows people to sit next to each other comfortably. "The metal seat takes Mattiazzi to a new place – an experiment that has some of the qualities of those beautiful Japanese copper and cypress washing buckets," said Hecht. Colin added: "It's a very practical piece for how we might work or eat at a long table, when we also need a place to put something we carry." The Zampa collection by Jasper Morrison comprises a low and high stool in ash wood. With gently curving legs and a round, flat seat, the stools feature a minimum of joins. 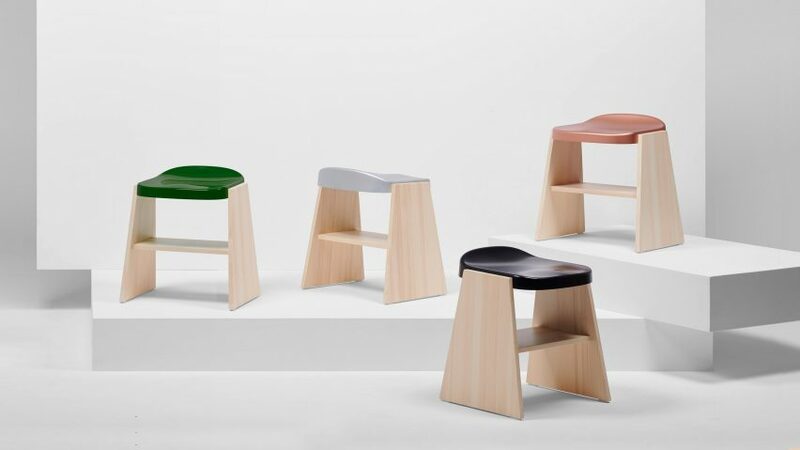 The brand said that the seat in particular is a technical achievement in that it is simply structured to provide some flex and therefore has softness in how it sits. "I noticed some old country stools, handmade with curved stick legs and roughly connected to circular solid wood seats," explained Morrison. "This design is a reminder of this very direct solution to having something to sit on. Their charm and character are irresistible though they couldn't be more direct and everyday in a practical sense. This new version is light and adaptable for use as a stool or small side table beside the bed, in the bathroom or wherever they're needed." Although described by Mattiazzi as "an expertly constructed wooden object that is not a stool and not a low table", the Cugino stool by Konstantin Grcic could function as either. With a chunky circular top and three-legged base, the Cugino is made from solid oak wood. "Cugino is the result of many tries; it happened over time, with wanting it to be an object that we don't already know, but also something that is maybe a little bit familiar, said Grcic of the design. "If I am being provocative, it's in that Mattiazzi has a lot of technology and I ask them not to use it, because I don't think it's always necessary. To see what we can achieve without all the technology is important." The fourth collection, Leva, by Foster + Partners is a chair in ash wood that was inspired by the efficiency of the form and materiality of an oar. "The chair remains the archetypal furniture piece and one of the most difficult objects to design, requiring a deep understanding of form and comfort," commented Mike Holland, head of industrial design at Foster + Partners. "It must be pleasing to the eye, able to fit a variety of settings from living rooms to restaurants, comfortable to sit on, and durable enough to last generations." The first timber chair designed by Foster + Partners, the design features steam-bent arms made of a single piece of machined ash that are slightly inclined, widening in the middle to form a comfortable, supportive backrest. Mattiazzi said that its simple shape is the result of complex surfacing that optimises the chair for mass production, and that the sparing use of material is rooted in the idea of sustainability – to do more with less. Speaking about the new collections, Sam Hecht and Kim Colin said that they are "all unique and positively experimental in form, use and relevance for the home, the office and hospitality." "They are all produced with passion from the heart, intelligence of the mind and perseverance from the soul," they said. Other furniture collections launching during Milan design week include a 150-piece lifestyle collection by Hong Kong architect André Fu, and a series of cast glass chairs by Nendo for Venetian brand WonderGlass, which feature a U-shaped bases formed by the effects of gravity on molten glass.